I spent the last hour of my trip doing one of my very favorite things- strolling the World Showcase in Epcot. I was at the Canadian pavilion when I realized it was time for me to head to the International Gateway and make my sad walk out for the final time. Just as I was passing the large gate to the backstage area (Millenium Village/World Showplace) between Canada and Great Britain, the gate opened to reveal Ariel in her ball gown. A Cast Member invited me over to come in and say hello. After chatting and taking a few photos, I walked out and heard them close the gate behind me. As I make my way through Great Britain, I see my destination in the distance. But wait! Now I'm face to face with Mary Poppins, in her beautiful red travelling coat. I've always wanted to meet Mary, and there she was, with no line, as I was on my way out! After that meeting, as I walked down the hill towards the exit, my phone buzzed with an incoming message- a well-known personality in the Disney community was now following me on Twitter! How cool is that? Now it was really time to go. 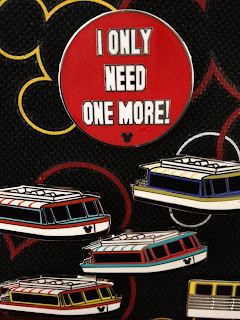 I reach the International Gateway, and as I say my final goodbye to the Cast Member at the turnstiles...and I look down to see that she has the completer pin I've been searching for all weekend! This all happened in the final 10 minutes of my visit. Pixie Dust is real. Sounds like a great sister's birthday celebration weekend!! Way to go out with lots of pixie dust, too!! Those last moments are usually just sad and brutal for me. It's awesome that your's turned out so well! What a fabulous way to end a great trip! Wow! Talk about the fates aligning! It's like it was all meant to be!